TTW Design the Wivenhoe to University Cycle Path! Honestly there's nothing I'd like more, than to be wrong about this. I'd shed tears of actual joy if the impending Wivenhoe to Essex University cycle path turns out really well, and embracing local government (with literal hugs if needs be) is definitely one of the basic tenets of Transition – but I've ridden my bike in the UK too often (and I fell head over heels in love with cycling in Denmark and Holland where they do this stuff really well) to have faith in the-powers-that-be delivering a really decent cycle link to the Uni. So I've decided to self indulge and have a go at designing it myself. “I hereby predict that I (and others) will not use the path that's built as it does not allow cycling at a reasonable speed [to be sure, he's talking about commuting speeds, not racing – ed.] in safety. Many boxes will be ticked, however, and many pennies spent. Normally I'd think that much cynicism is perhaps a bit too much cynicism, but I've recently had some fleeting insight into how this stuff gets delivered (and I've tried using the finished products) and I'm worried he's got a point. Now, it happens that I've got zero relevant skills or expertise here. So I'm going to have to rely on readily available information to help me out. 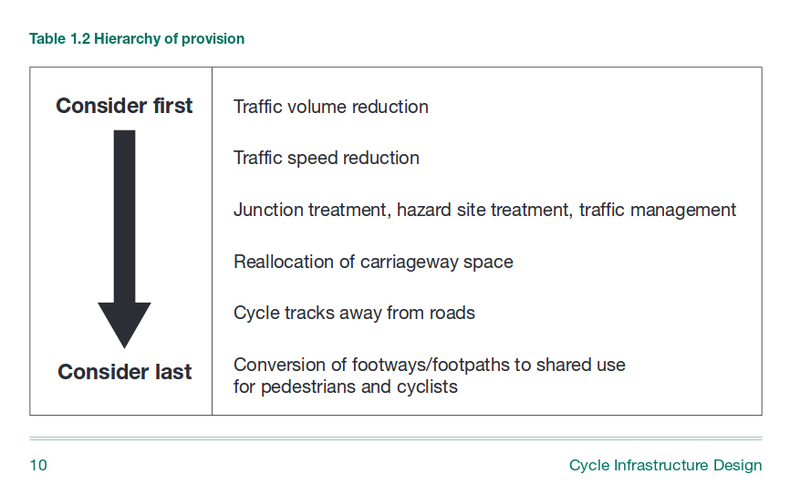 Here's how the Department for Transport suggest Local Highways Authorities (and now me) go about designing provision for cycling. Given their enthusiasm for squeezing walkers and cyclists together at every opportunity and the apparent absence of enthusiasm for doing any of the other options, one imagines Essex County Council have a copy of this chart [from LTN 2/08] prominently displayed on the wall in their office, except somehow they managed to get some of it upside down. One last thing before we get started. I'm going to design using the principle that my new Local Transport Network should be (and I fancy this to be quite radical) welcoming to all users. Next post we're going to use lateral thinking to improve the route to the Uni by fixing an accident blackspot on the way to Alresford, which is in the other direction.